Added 7/28/2009 Here we see what appears to be the Gatchaspartan landing on some Galactor goons (again, when it rains goons, it pours goons) and a sub boss. Man, look at those fingers. 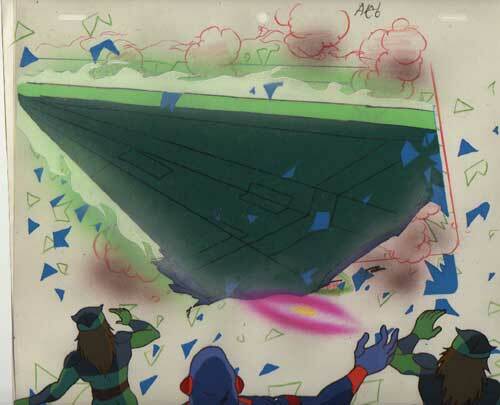 Full of action, yet quite the crappy shot, it at least shows off just how much Gatchaman ended up ripping off Star Wars' Star Destroyers for the design of the Gatchaspartan.